Christmas is fast approaching, and many organisations will be buying LED fairy lights and festoon lights to decorate their premises. But what should you look for when selecting LED fairy lights, or festoon lights? Colour temperature is critical to good lighting design. Especially, architectural lighting where a great deal of attention is paid to how the environment, people and other objects will look when lit. We have heard of cases where warm white LED fairy lights have a poor colour temperature, with too much green being present. In some applications this can be a real problem. For example, in a restaurant this can have the unfortunate effect of making people look somewhat ‘sickly’ and making any food being served look stale. Before installing any LED lights be sure to test a sample to ensure the colour temperature is appropriate for the application. Reliability is a major concern for anyone designing and installing commercial lighting in Australia. It can cost $10,000’s to install a complete tree full of fairy lights and you don’t want to be continually called back because of failures. The LED driver is a key component of any LED lighting system and care should be taken to ensure that a suitable model has been selected. MEAN WELL’s HLG series LED drivers are very popular with commercial installers, because of their long 7-year warranty and rugged metal enclosure. They also have a wide operating temperature range and come with an IP67 ingress protection rating, which makes them suitable for use outdoors. Bear in mind that no LED driver should be mounted in direct sunlight. This will cause the internal temperature to rise above the operating temperature range and could potentially cause a failure. Such failures are not covered by the manufactures warranty. 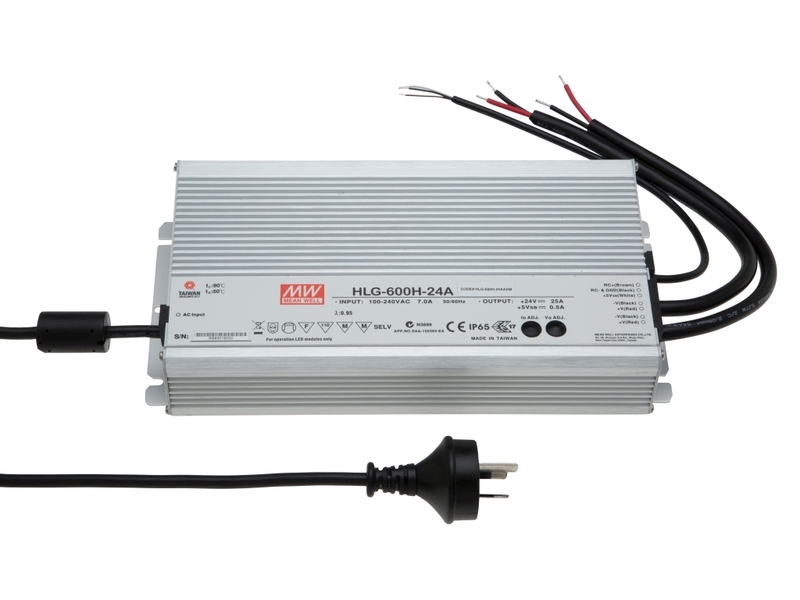 The HLG series LED drivers are also available in a dimmable version, which is compatible with 1-10V dimming controllers (0-10V for the 480- and 600-Watt models), PWM type dimmers and potentiometers. Time is money and one of the biggest headaches with some LED fairy lights is the length of time it takes to install them. This is because they can be supplied on large reels. Electricians are expected to cut off what they need and then fiddle about terminating the different lengths in a safe manner. To reduce installation times, look for a LED lighting system that utilises a quick interconnect system, which you can ordered in different lengths. All the installer has to do is quickly join the different lengths of fairy lights together using the pre-fitted connectors. Make sure the connectors are waterproof if you are working on an outdoor installation. ADM is Australia’s leading supplier of MEAN WELL LED drivers. If you would like advice on selecting a suitable LED driver please call 1300 236 467. A member of our expert team will gladly answer any questions you may have.